This week John is still in the wilderness and different groups of people are coming to him asking what they should do to affect repentance. These groups are primarily those who are at the edges of society – those who their contemporaries, the Pharisees, would consider to be outside the circle of God’s people. But for Jesus and for God there is no one who is outside. God reaches out to all; God pursues all, even and especially those who are on the edge, those who have been put outside by society, and they are all invited to active repentance. Below is my favorite paiting of John the Baptist. It is from an altar piece by Matthais Grünewald - 1475-1528. 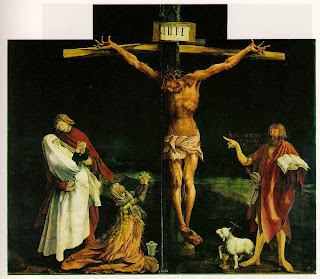 The painting is of the crucifixion of Jesus - which is clearly in the center. But the the right, in red, there stands John the Baptist, holding the book of the prophets, pointing to Jesus. Here at the beginning of the story, we need to be reminded that the cross stands in the center of our faith. John the Baptist, Christmas, shepherds, angels - all of these point towards the cross. Our calling is also to point to the cross. Just when we think that everything is predictable, settled, established; just when we think that everyone is in their place then John comes along and points to the cross. The ultimate symbol of God's annoying habit of turning things upside down. John calls us to repentance - to action - in preparation of the coming of the savior to be crucified - for us. May the image of the cross lead us all to some active turning around.